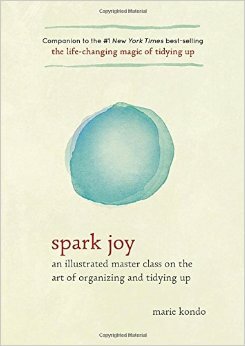 Spark Joy is the follow up to the life-changing magic of tidying up by Marie Kondo. This is the master class. I was looking forward to reading it because I need the help. Before we bought this 5,500 sf restoration project, I had a place for everything and everything in it's place. Here, there has been no storage. We have 3 closets the size of hall closets for our entire house. There is always remodeling material and equipment out. Truthfully, I have been completely overwhelmed by the sheer volume of stuff out and visible. Also, people keep giving us random things they think we might need and it's just too much. There are things that Marie states in her writing that I think are funny because I just could not or would not do them that way. She is always talking to objects or talking about the spirit of a piece. She thanks things for serving her. I know those things cannot hear me or appreciate my words, but I did realize how being grateful changes how you honor something. Recently, my husband hit a deer and totaled a car my dear friend gave to me. When I went to collect my personal items from it, I did pause and think God for it and how it served me. It helped me not be upset. I felt thankful. Another thing I loved about her method was finding what sparks joy. The problem with most of our lives is that the secondary items are running things. They overflow every available space. They clutter up our minds. We are not fulfilling our dreams and living out our hearts' desires because of mental and physical clutter. I was so entrenched in survival and getting through that I forgot what sparked joy. Then again, maybe I never believed I could look for it. The great thing about seeking out what you truly use and want to use is that it makes more space for good things in your life. You delight in things that were there already. You seek out what you truly need and you honor it. Marie tells us that when when we are ambiguous about things, we are often the same way about people. We haven't learned to properly care for things. In my mind, our relationship with our stuff and how we honor it or don't is training for how we interact with people. I love how she says things appear more worthy and beautiful when they are honored. We must learn to honor the things of others as well. It's something I think is missing in our consumer culture. I have enjoyed seeking out things that spark joy, honoring things I love with the space the secondary things were taking up. Now they have space and I can quickly get to everything I am looking for. Of course, there is still a ways to go, but I am going the right way. "Only when we accept unconditionally people whose values differ from our own can we really say that we have finished tidying." "When you have truly finished tidying, you'll see what you want or absolutely must do next, so you really don't have time to waste complaining about others." It's about getting your own house in order. "I want to live in such a way that it colors my things with memories." This book was graciously provided by Random House Publishing for review.